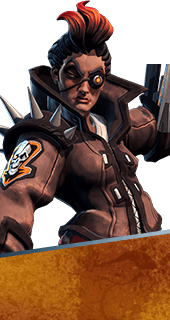 Priority Target is an Ability of Reyna in Battleborn. Fire a homing blast that deals 81 damage (+50% bonus to shields) and reveals the target's position. The target takes 116% incoming damage for 6 seconds. Increases the speed and range of Priority Target's homing blast. If Priority Target fails to mark a target, half the cooldown is refunded. +67% Speed and Range. Reyna's Laser Pistol and Plasma Pulse briefly slow enemies marked with Priority Target. +3 Seconds Slow Duration. Increases initial impact damage of Priority Target. +107 Damage. Increases the duration of Priority Target’s debuff effects. +4 Seconds Duration. Increases extra damage suffered by enemies marked by Priority Target. +16% Extra Damage.